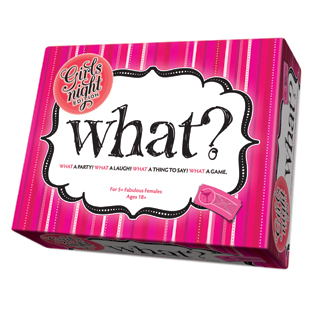 What?® Girls Night Edition is hands down the best board game for adults of the female persuasion; in other words, "Girls Only!". What?® Girls Night Edition is tailored for a fabulous and fun girls night. Girls will boldly tell the truth or tell bold face lies, but all in good fun! Like the original What? party game, there are three types of questions to be played. The general question is great for starting off the game. Then move to the fill-in-the-blank question and you could use a famous person's name or the name of a girl at the party! The third cateogry, sticky situation, sets up a story to see what you would do, which is always fun! This is a fun and silly party game for a bachelorette party, a girls night, a retreat, or at a family reunion for when the men go out to do their 'manly things'! There is no need to be truthful! There is no need to be tasteful! Feel free to be as silly or as funny as you want… honesty is not the best policy in this game! What?® Girls Night Edition was presented in the gift bags at the 2012 Emmy's! Click here to see a picture of the original What? party game as seen on The Real Housewives of Beverly Hills game night episode. As seen in gift bags at Emmy Awards in 2012! Case Pack 6 Width 9"
Item # 39388 Weight 1.30 lbs.